One of the best things about squash is its bright orange, delicate blossom. It's perfect for stuffing, frying or finely chopping to add delicious peppery flavor to almost anything. Here, 6 incredible ways to cook with the fantastic flowers. Stuff raw blossoms with pimento-laced ricotta for a light and fresh summer hors d’oeuvre. 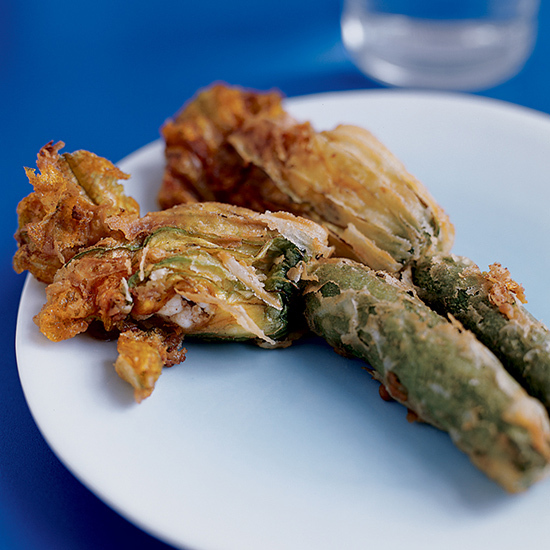 In Greece, zucchini flowers are often added to vegetable stews or to grated zucchini and cheese for savory pies. Blogger Katie Quinn Davies tops crisp pizza with both zucchini and zucchini blossoms. Chef Fabio Trabocchi cooks pasta in the style of risotto to create a rich, silky sauce, then garnishes the dish with zucchini blossoms. Squash blossoms mellow flavor are sublime with melted cheese; serve them lightly wilted inside a quesadilla for a very quick and ultra-satisfying treat. This healthy frittata is great to make with whatever vegetables are on hand.